Larry Parrish knew something was wrong as soon as he wheeled his state-owned pickup off the West Virginia highway and onto the rocky field where the natural gas well was supposed to be. Oak trees 18 inches in diameter looked dead as boards, and brush as brown as kindling stretched across a piece of farmland the size of a football field. The dead zone in this otherwise lush mountain country meant one thing to Parrish: Gas drillers had been illegally dumping briny water mixed with chemicals, and the waste had killed everything from the rusty well head all the way downhill into a creek. The worst part, Parrish said, was that the devastation could have been avoided if the West Virginia Department of Environmental Protection had had enough inspectors to make sure the state's growing number of gas wells were checked regularly. "It was sad -- sickening," said Parrish, a former field inspector for the DEP's office of oil and gas. "It probably had been years since anybody had been out there." West Virginia has added a handful of people to oversee its growing drilling industry since Parrish retired in 2006, but other than that not much has changed. For the state's 17 inspectors to visit West Virginia's 55,222 wells once a year, they would have to inspect nine wells a day, every day of the year -- no weekends, no vacations. "We are doing what we can do," said Gene Smith, a regulatory compliance manager for West Virginia. "But that still leaves thousands of wells that are not inspected yearly or even every decade." Regulators in other states are equally overwhelmed as they try to keep tabs on the nation's nearly one million active oil and gas wells, a number that's likely to climb as the feverish growth in natural gas exploration continues. Search ProPublica's database  to find how many gas regulators work in your state. A ProPublica investigation  comparing the rapid expansion of drilling in 22 states with staffing levels at the agencies charged with policing the wells found that the nation's capacity to enforce its environmental protections is weakening. The picture strikes at the heart of the industry's long-standing argument that state regulatory agencies will be more effective industry watchdogs than the federal government. While the number of new oil and gas wells being drilled in the 22 states each year has jumped 45 percent since 2004, most of the states have added only a few regulators. Those with the widest gaps are Texas, which is already grappling with the most drilling, and New York, which is expected to soon have the fastest rate of growth. As regulators' workloads have grown, enforcement actions -- the number of times violations were recorded and acted on -- have dropped in many states, often by more than half. That could mean companies are complying with the law -- or that inspectors aren't checking the wells. "You just can't do it, physically," said Parrish, who received a $31,000 salary and said he was chronically overworked. "You've got to put out the hottest fires and there was a lot of stuff that slipped through the cracks because no one was looking." The imbalance between drilling growth and regulatory staffing levels could become a crucial factor as lawmakers and the public weigh how much environmental damage to expect in exchange for the benefits brought by the drilling boom. Thanks in large part to advances in drilling technology, estimates for the amount of natural gas held underneath parts of the United States have increased by 35 percent since 2007 and are now believed to be plentiful enough to meet the nation's needs for more than 100 years. As a result, drilling is expanding rapidly, including in the Marcellus Shale, the layer of rock that stretches from central New York, underneath West Virginia to Tennessee. The boom, however, has brought complaints of water and air pollution. Modern gas drilling in particular has drawn scrutiny because it relies on hydraulic fracturing , a process that injects millions of gallons of chemically infused water underground and produces large volumes of waste. The industry has fended off efforts to establish stricter regulations in part with its argument that the current state oversight is effective. What it takes to enforce regulations, and whether authorities have enough resources to get the job done, are questions that rarely enter the debate. "Not having eyeballs on the ground is horrendous," said Jim Baca, who served during the Clinton administration as director of the U.S. Bureau of Land Management, the federal agency that oversees more than 85,000 oil and gas wells on federal land. "If you don't enforce the law, the industry will do whatever they think they can get away with." Spokesmen for state and federal regulatory agencies defend their effectiveness and caution that the picture is more nuanced than mathematical equations can convey. They say that they are working to improve efficiency in their departments and that the number of inspectors alone doesn't always reflect enforcement because staffers can be shifted to meet urgent priorities. Employees might have capacity in their workload to absorb much of the growth in drilling that is taking place, they say. "They may have to work a little harder," said Stuart Gruskin, New York's executive deputy commissioner for environmental conservation, about staffing in his state. "It's like any other business. You can adjust from a management perspective how you utilize your resources until you reach the point where you are not doing a good enough job." The New York State public employees union disagrees. "Attempting to have them do even more with less is not possible," it said this week in a statement calling for delaying the expansion of drilling for at least a year because of, among other things, what it called understaffing at the Department of Environmental Conservation and other state agencies. No state has more drilling than Texas, which has 273,660 wells and just 106 regulators to oversee them. As in most states, regulators for the Railroad Commission of Texas, the agency that is charged with oil and gas regulation, are kept busy by a broad range of responsibilities. 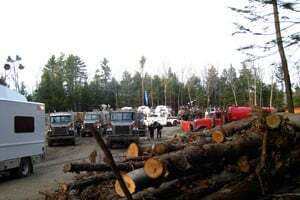 They police gas wells, oil wells, waste injection wells, disposal pits, compressor stations and access roads. The wells can be spread across hundreds of miles, sometimes peppered throughout difficult-to-access terrain, with limited cell phone or computer access, heavy rains and rough roads requiring four-wheel drive. Regulators also approve new permits -- and try to do it fast enough to not saddle the companies applying for them with extra costs. They visit new wells several times during construction and old wells before they are shut in, or sealed. They are obligated to quickly respond to all complaints, which can range from an unauthorized flaring of emissions or gases to a spill of hazardous fluids. 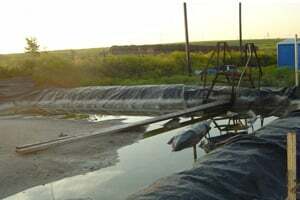 Eighty-three of Texas' regulatory staffers conduct field inspections, according to the commission, meaning each person is responsible for almost 3,300 wells, many of them requiring several visits in a year. As in West Virginia, keeping up with the workload is nearly impossible. "It's one of the worst-kept secrets around the state that the wells that are ostensibly checked once a year aren't," said Jeff Weems, a Houston attorney who specializes in the energy industry and is running for the top job at the Texas Railroad Commission. "They could double the number of inspectors and still be straining their staff to do their job." In Texas, as in most states, regulators prioritize their work to make sure the most essential inspections get done. Complaints and spills top the list, along with new well construction. But the Texas auditor's report found that 30 percent of all spills were inspected "either late or not at all." "It is quite clear to management that inspecting 100 percent of these notices ... is not possible with current resources," the Railroad Commission wrote in its response to the audit. "To the extent resources become available in future legislative sessions, the Commission could witness more activities." A spokeswoman for the commission said its workload decreased when drilling activity slowed in 2008, so the staffing situation has improved. She said the agency conducted 128,270 inspections in 2009, and visits every site it deems essential. "Texas has maintained and will continue to maintain a strong enforcement effort for our environmental rules, regulations and policies," the spokeswoman, Stacie Fowler, said in an e-mail. But the commission's Web site  also makes clear that facilitating energy production is a priority and the state won't slow drilling while inspections catch up. It advertises  the current waiting period for approval of new drilling permits: three days. According to ProPublica's analysis , the number of new wells drilled each year in Texas has jumped 75 percent since 2003. However, staffing increased just 5 percent during that period and enforcement actions increased only 6 percent. Records show that the Railroad Commission's budget for monitoring and inspections has decreased 10 percent since 2005. Fowler said the agency had requested more staffing from the state legislature at least three times in the last five years and been turned down every time. From the industry's view, the paucity of enforcement staffing sometimes means it is up to the drilling companies to follow the rules as best they can. "I never saw a Railroad Commissioner on one of the sites," said Dale Henry, a hydraulic fracturing expert who worked in Texas for the global services company Schlumberger for several decades. Henry said companies abided by the law whether regulators were there or not, but he also said the normal work schedule meant that they often avoided regulators. Inspectors worked 7 a.m. to 5 p.m. weekdays, and "all the work in the field is done by operators between 5 p.m. and 6 a.m. and on weekends." A Schlumberger spokesman said that the company works closely with regulators and that it is the nature of the process to work through the night. 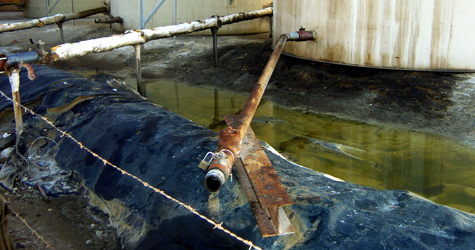 Even when regulators do inspect problematic sites, the oversight can be patchy. In September 2007, a field inspector working in the Barnett Shale outside of Fort Worth made a routine stop at an underground injection disposal well site. His formal report  (PDF) found no problems and stated: "Well area clean." Inspectors returned 61 days later after a resident complained of spilled oil, overflowing dikes and green-colored fluid in standing puddles. According to their report  (PDF), they found that "oil-stained soil" had seeped several inches into the ground around a large tank, that the "containment dike will not hold estimated capacity" and that standing rainwater had oil in it. When asked about the discrepancy, Fowler, the Railroad Commission spokeswoman, said conditions can change at a site on a daily basis. But Fowler did not address perhaps the most remarkable finding in the inspectors' report  (PDF): State records showed that the well site was not being used, when in fact it was actively being injected with hazardous waste. "We looked at some records and found that the well was never technically shut in," said Charles Morris, the now-retired inspector who wrote the second report about the troubled well. "That happens all the time in the field, too. I hate to say it, but the commission, sometimes their record keeping is not what it should be." Texas' staffing challenges match a pattern across the states where drilling is most active. 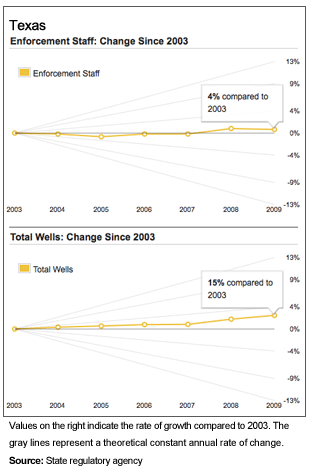 The number of new wells drilled in West Virginia  increased 53 percent from 2003 to 2008. Since 2003 its regulatory staffing increased 20 percent. Enforcement actions, meanwhile, remained relatively constant, though they temporarily dropped by more than half during a peak in drilling in 2007. North Dakota  saw a 987 percent increase in new wells drilled each year since 2003, but took 13 percent fewer enforcement actions, even though it added five regulators. In Ohio , where the number of new wells drilled each year doubled between 2003 and 2008, four new staffers were hired but the number of formal actions dropped 33 percent. Not every state saw a drop in enforcement actions. In Pennsylvania , a state with intensive new Marcellus Shale drilling, state regulators doubled their enforcement staffing last year. 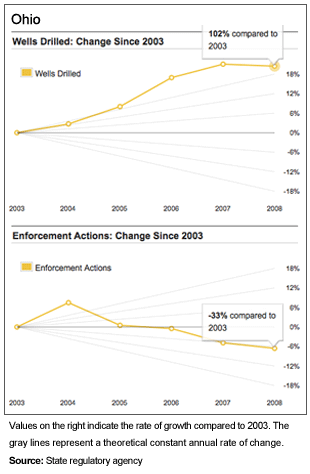 Between 2003 and 2009 enforcement actions increased by 60 percent. Of the 21 states that supplied data on their enforcement actions, five substantially increased those actions even as their staff-to-well ratio lagged. In Louisiana , for example, staffing was flat or falling until 2007, when more inspectors were hired and enforcement actions began shooting up. As a result, the state took almost twice as many enforcement actions between 2003 and 2008, even though the overall staff growth was just 3 percent and the number of new wells drilled annually more than doubled. The federal government, which separately regulates a large proportion of the drilling on federal land in Western states, is also struggling to police its territory. It has seen a 31 percent increase in drilling since 2003. 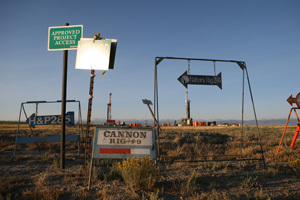 A 2005 report  (PDF) from the U.S. Government Accountability Office said that the Bureau of Land Management's ability to meet its obligations had been lessened by intense growth, and that "staff had to devote increased time to processing drilling permits, leaving less time for mitigation activities, such as environmental inspections." The agency has significantly expanded its staffing since then. But even so, a 2009 analysis of its enforcement activity by the Western Organization of Resource Councils, a group of environmental organizations, found that the agency issued fewer enforcement actions in 2007, the last year for which data was available, than it did in 1999. The analysis, which focused on BLM enforcement and inspection in five Western states, found that BLM inspectors spent a third less time on environmental inspections and completed only 15 percent of the highest-priority inspections. In Farmington, N.M., for example, BLM inspectors completed just 82 of 1,257 high-priority inspections. In Buffalo, Wyo., they finished just 136 of 3,527 red-flag jobs, according to a federal database. "If you ask any BLM staff who has been dealing with the oil and gas industry, they admit they don't have the staff do deal with this. It hasn't been a priority," said Daniel Patterson, an Arizona state representative and southwest regional director for the group Public Employees for Environmental Responsibility, which works to convey confidential views of its government employee members. "It's pretty much up to the operator to decide if they are going to operate legally or if they are going to cut corners that lead to more pollution. That's a problem." State and federal regulatory officials say that there is no such thing as a proper ratio of enforcement actions to wells, and that there is no way to measure how effective informal warnings between inspectors and operators are as a deterrent. Such warnings are not recorded in regulators' statistics. They also say there are myriad ways to increase the effectiveness of their oversight, including investing in new technology that improves efficiency and writing stronger laws. Colorado , which has seen a 149 percent increase in the number of wells drilled each year since 2003, is one state that has done both. In 2006 the state hired several new inspectors and began computerizing its records and equipping field regulators with laptops full of everything from well histories to violations. In April the state instituted new drilling regulations that are widely seen as some of the toughest in the country. "We now have more prescriptive rules and policies, which will help to prevent problems that could otherwise evolve into violations triggering the need for enforcement," said David Neslin, director of the Colorado Oil and Gas Conservation Commission. Whether that is enough to do the job remains to be seen. One new hire is Chuck Browning, who came on eight months ago as a field inspector for the northwest part of the state and said the magnitude of the job can be overwhelming. With two other inspectors, Browning shares responsibility for some 25,000 wells. He bounces back and forth between the Utah and Wyoming borders, tallying 17,000 miles on his Trailblazer since March. "I'm off in some far-flung remote area of the country side and there's thousands of wells around me," said Browning, a former geologist who has worked in the oil industry for 20 years. "I just pick my way out of the woods knocking them out as best I can." Not long ago, Browning was wandering through the Rangely field -- an eight-mile wide swath of oil, gas and injection wells that stick up out of the brown arid plain of Northern Colorado like candles in a cake -- when he stumbled on an unmarked open pipe jutting out of the dirt. Gas fumes wavered six inches in the air and when Browning dropped a pebble into the hole, he heard a kurplunk as it struck liquid. 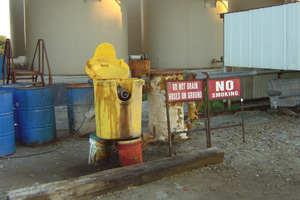 Abandoned wells are supposed to be capped and dry -- but this one was about to overflow. In his truck he fired up his laptop, accessing topographic maps, records and aerial photos of some 88,000 wells across the state, searching for this one. But it didn't appear anywhere. "I still absolutely have no idea how many wells are up in Rangely. It's well over 1,000," he said. "This one is definitely a potential hazard." It was the kind of puzzle that can take a day to sort through, and at least another day to bring in the equipment and crews to begin to take care of the abandoned well. It's a wild card that can play havoc with the 10-wells-per-day inspection schedule Browning and so many other regulators are forced to keep. If Texas and Colorado -- the first- and eighth-ranked states in the country  for number of natural gas wells -- can provide a lesson, states like New York may have the most to learn. New York, which sits atop the Marcellus Shale, has found itself at the epicenter of the nation's drilling boom and the epicenter of the debate over drilling's effect on the environment. The state's relatively small oil and gas division currently oversees some 13,684 wells, but it is under intense pressure from drilling companies, which would like to see thousands more wells drilled. Chesapeake Energy, one of the nation's largest natural gas companies, has gobbled up more than a half a million acres of land leases in New York, and earlier this month Exxon said it would pay $31 billion for XTO Energy, a gas company that also holds extensive rights to drill in Pennsylvania and West Virginia's Marcellus Shale. The state has delayed that development, however, to study the environmental consequences of hydraulic fracturing and investigate a chorus of objections from people who fear that drilling will contaminate drinking water. Just last week New York City called for a ban  on drilling inside its watershed, citing a consultant's report that said it could jeopardize the drinking water for nine million residents. At the same time, however, Gov. David Paterson, reeling from one of the worst state financial shortfalls in the nation, has made gas development a cornerstone of his draft energy plan. New York regulators say that they have a better environmental record than most states when it comes to regulating oil and gas, and that a suite of proposed rules will put the state's drilling laws on par with Colorado's. Yet New York  is the only state examined by ProPublica that has cut its regulatory staffing in recent years. Since 2003 New York's Department of Environmental Conservation has reduced its oil and gas division field inspector staffing by 20 percent (its overall enforcement-related staff, when including management and office positions, dropped 10 percent), stoking concerns that when the drilling kicks into high gear, the state will suffer the same sort of problems that have plagued West Virginia and Texas. Gruskin, the New York DEC's executive deputy commissioner, says that the agency is committed to good oversight and that energy companies that want to drill in New York will simply have to adapt to the agency's pace. But Gruskin's promise not to let drilling outpace his headcount doesn't match the recent past. Even as the regulatory staffing was being reduced, the DEC allowed a 676 percent increase in new wells drilled each year, a statistic that makes New York one of the fastest-growing drilling states in the nation. Meanwhile, the state's 16 field inspectors took only three more enforcement actions against drilling companies in 2008 than they did in 2003. If the flat enforcement statistics were a problem, Gruskin said, the number of spills and environmental problems would have gone up -- something he points out hasn't happened. And unless it does, the state appears content to play chicken. "I don't think the industry believes that our resources have become so thin that they are not going to get caught." Gruskin said. "There are a lot of eyes on what is going on." ProPublica reporter Sabrina Shankman contributed to this report. So did ProPublica's director of research Lisa Schwartz and researcher Kitty Bennett.